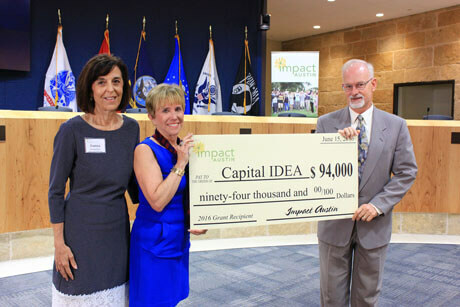 Impact Austin members have selected Capital IDEA as a grant recipient twice! In 2009 an award of $102,000 funded college tuition, books and fees for students; and a 2016 award of $94,000 will allow Capital IDEA to serve more rural moms pursuing the education to secure a great career. Impact Austin generates excitement and awareness about the wonderful nonprofits operating in the community, and the impact of their funding goes beyond dollars—when members share stories of nonprofit programming, they encourage larger audiences to support critical programs. Impact Austin began in 2003 as one of the largest women’s philanthropy groups in the nation. Impact Austin members are dedicated to helping women become philanthropists in our community. Members’ annual donations are added together to give multiple high-impact grants each year to local nonprofits. Membership requirements are simply to be female and to make a $1,250 donation each year, with $1,000 going to provide grants for the important work done by grant recipients and $250 going back into Impact Austin to support daily operations and membership development.